See Charles Prazenica's story here. 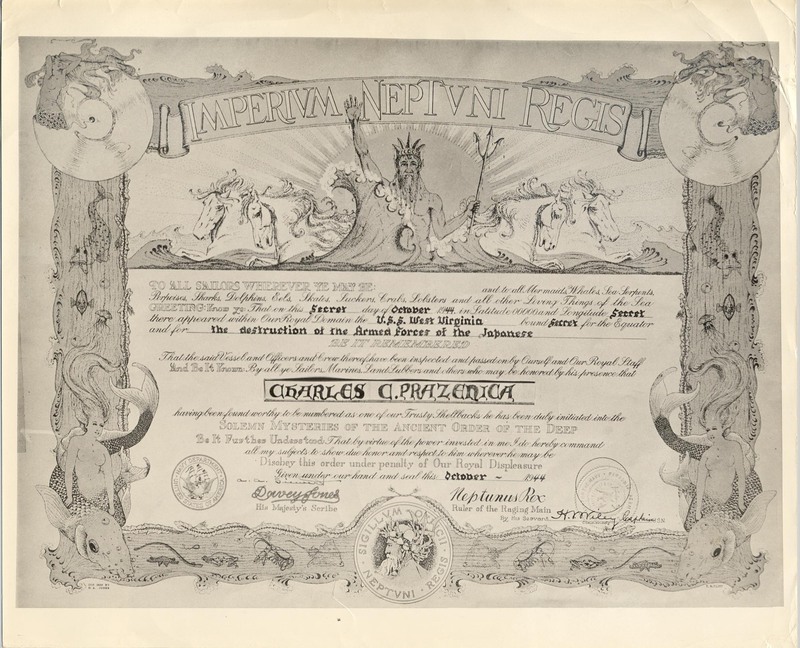 Click the image below to see Mr. Prazenica's equator crossing certificate. Click here for a larger and more readable version. Charles C. Prazenica, AERM 3/c, born July 31, 1925, in Pennsylvania. 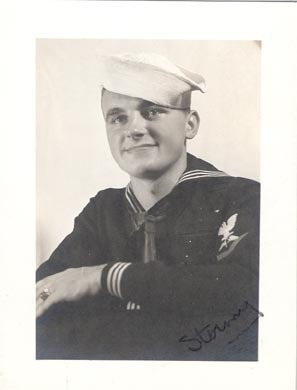 Joined the USNR Sept. 2, 1942, and served in the USS Richmond and USS West Virginia. He participated in campaigns from Aleuetian Islands in North Pacific to the South Pacific. Memorable Experiences: witnessing a Japanese battleship being blasted and sunk in Leyte Gulf; Japanese kamikaze hitting the Wee Vee aft of the signal bridge on the port side. He was in the aerology office and knocked down by the explosion. He lay on the deck waiting for the bomb to "go," but thank God a dud. He helped fight the fire and also helped Simon Manzler (ship's photographer) to take pictures of the damage in the galley -the big soup caldron with plane parts and the pilot's head in the soup pot. This was a sad day; they lost four shipmates and many more were hurt. It was also a thankful day, as the 500# bomb broke in pieces and did not explode. Discharged Dec. 21, 1945. His awards include all the regular ribbons given for the North and South Pacific. Married Nancy and they have five children and five grandchildren. Employed in mechanical contracting and consulting; vice-president. Hobbies are puttering, baseball, football and golfing.